Is it possible to load the network faster? Try to use FreeCommander for network loading, you can find it in main menu item “Tools → Settings → Network”. If this option is chosen, the network is loaded directly by FreeCommander. FreeCommander may provide higher performance than does Windows, especially for loading large networks. How to show the hidden shares? 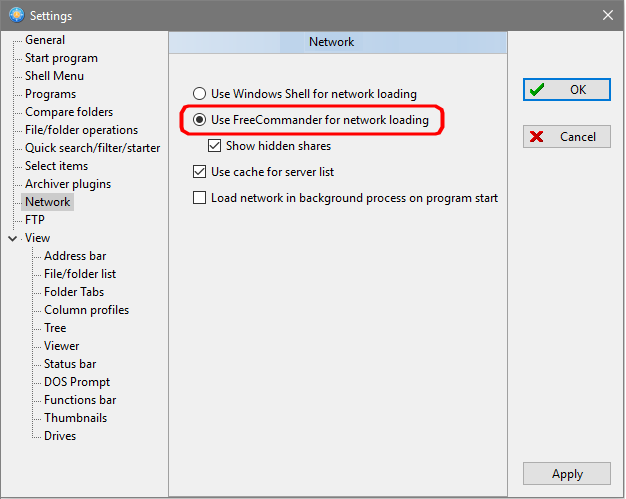 If the network is loaded by FreeCommander, the setting “Show hidden shares” can be checked. This will display shares that are not visible in Windows (e.g. ADMIN$). Is it possible to show network as drive? Open the “Settings (F12) → View → Drives → General” and select the option “Show network as drive”.